e-Learning and other innovative open learning multimedia modalities of delivering education are being introduced to enhance learning opportunities and facilitate student access to and success in education. This article reports on a study that assessed students' readiness to make the shift from traditional learning to the technological culture of e-Learning at a university in Durban. A quasi-experimental study design was employed to assess such readiness in first year nursing students before and after an appropriate educational intervention. 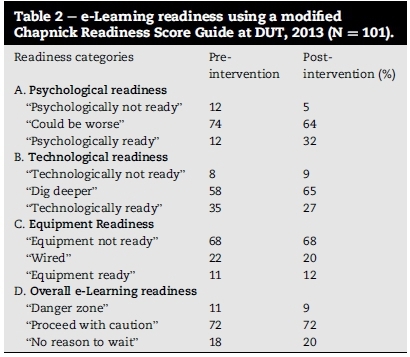 A modified Chapnick Readiness Score was used to measure their psychological, equipment and technological readiness for the change in learning method. It was found that, while students' psychological readiness for e-Learning was high, they lacked technological and equipment readiness. Although e-Learning could be used in nursing education, technological and equipment readiness require attention before it can be implemented effectively in this institution. Fortunately, these technical aspects are easier to resolve than improving psychological readiness. An undergraduate nursing programme was established at the Durban University of Technology (DUT) in 2012, in accordance with an undertaking by the South African Department of Higher Education and Training to grow post-school education and training for health professionals (Department of Higher Education and Training, 2013). The Durban University of Technology aims to produce graduates that are active, reflective, critical and creative thinkers who are able to work independently and collabora-tively and are effective communicators as well as being culturally, environmentally and socially aware within a local and global context (Sattar & Cooke, 2014). The university's management identified e-Learning as a key strategy and method to facilitate the development of some of these attributes. Cognitive research and theory suggest that e-Learning and other appropriate concurrent multimedia modalities may enhance learning. e-Learning also serves to fulfil the government's requirement that universities deliver enhanced learning opportunities through diverse modalities that increase student access to and success in higher education (Department of Higher Education and Training, 2013). The DUT e-Learning strategy was developed during 2012 (Dark, 2012) and a project was launched to strengthen e-Learning services and support in all faculties and on all campuses. The DUT e-Learning policy was approved and implemented in 2016 in which the policy dictates the stance of e-Learning at the institution (Stewart, 2016). The policy indicates the adoption of e-Learning as a core strategy in keeping with the institutions' strategic plan. The study on which this article is based is part of this project and aimed to assess first year nursing students' psychological, technological and equipment readiness for implementation of e-Learning. The type of e-Learning offered to nursing students at DUT is blended learning, defined by Driscoll (2002) as a mix of instructional methods, including face-to-face learning experiences that are integrated with online and multimedia learning opportunities. The advantages of appropriately-designed blended learning include delivering improved education to students who are more easily motivated, and are active learner-centred and self-paced learning. "It also enables students to access materials 24 h per day, and the real world through Web-links, cost-effectively by reducing lecture time and increasing the opportunity to collaborate in constructive learning through online communities of enquiry" (Oellermann, 2014, vi). e-Learning has been found to be a popular educational modality of delivery for students enrolled in the management sciences at DUT. Although they still prefer to see their lecturer face-to-face, they reported gaining knowledge through e-Learning methods including the use of online self-tests. These modalities motivated students to engage in the learning process. The students who made use of the various e-Learning methods benefited academically as shown by a significant improvement in their marks (Oellermann, 2014, vii). Prior to implementing e-Learning, educational institutions need to ensure that they set clear objectives for the new strategy; consider the benefits and disadvantages of e-Learning and the range of possible e-Learning configurations that could be adopted in that specific educational context; and assess e-Learning readiness. e-Learning readiness is important to achieve if effective e-Learning programmes are to be accomplished (Kaur & Zoraini Wati, 2004). Readiness is defined as being "prepared mentally or physically for some experience or action" (So & Swatman, 2006). e-Learning readiness determines whether an institution and its students are psychologically and technically prepared and have the equipment to implement e-Learning (Borotis & Poulymenakou, 2004). Measuring e-Learning readiness makes institutions aware of what is required to optimally facilitate e-Learning in that particular context (Borotis & Poulymenakou, 2004; Chapnick, 2000; Djamaris, Priyanto, & Jie, 2012; Psycharis, 2005). A study on e-Learning readiness in Bangladesh reported that an institution that is ready to implement e-Learning provides the ideal environment in which continuous learning can take place (Karmakar & Wahid, 2000). In particular, in order to successfully introduce e-Learning, it is necessary to establish students' readiness for this type of learning. Several e-Learning readiness assessment methods have been documented in the literature (Borotis & Poulymenakou, 2004; Chapnick, 2000; Psycharis, 2005). The importance of using an appropriate tool to measure e-Learning readiness has been emphasised (Borotis & Poulymenakou, 2004; Chapnick, 2000; Djamaris et al., 2012; Psycharis, 2005). e-Learning readiness assessment should reveal the impact of information and communication technology on that education facility and identify areas that require attention prior to implementation. The Chapnick Readiness Model (2000) was used as the theoretical framework that underpins this study. Chapnick (2000) developed this model for determining the e-Learning readiness of an organization by providing answers to the following questions: a) Are we able to do this? b) If we are able to do this, how is it possible to achieve it? c) What will the results be and how do we evaluate them? • Psychological readiness, which focuses on an individual's state of mind as this impacts on the outcome of the e-Learning initiative. This type of readiness is regarded as being among the most significant aspects that could affect the implementation process. • Sociological readiness recognizes the characteristics of the environment in which the programme will be conducted. • Environmental readiness considers the forces affecting stakeholders both inside and outside the organization. • Human resource readiness reflects on the accessibility and plan of the human support system. • Financial readiness relates to the financial resources available in terms of budget size. • Technological skill readiness refers to the availability of technical support. • Equipment readiness deals with the ownership and availability of proper and appropriate equipment. • Content readiness focuses on the substance of the curriculum being developed for teaching. A quasi-experimental Interrupted Time Series Analysis study design was used as an efficient and feasible method to answer the research question, namely assessing the e-Learning readiness of nursing students. The study sample comprised all undergraduate first year Bachelor of Nursing Science students registered for the anatomy and physiology modules. The students acted as their own controls. They completed a questionnaire before the intervention was administered in order to assess their e-Learning readiness (control). A week later, they were given the intervention, an online classroom e-Learning activity. Immediately post-intervention, they completed the same questionnaire to measure any self-perceived changes. A custom-designed questionnaire was developed which included relevant questions sourced from different researchers (Chapnick, 2000; Matthew & Monica, 2011; McVeigh, 2009; Wahab, 2008). Questions were grouped into psychological, technological and equipment readiness factors. The questions were answered using a four-point Likert scale. A percentage score was calculated for each student's response for each of the three readiness factors and summed to obtain an overall technological, psychological and equipment readiness score before and after the intervention. The scores were categorised using the Chapnick Readiness Score Guide and those for negatively phrased questions were correctly aligned. A high score indicates that the institution and students were ready to implement e-Learning, whereas a low score means that they were not ready to do so. Categorical variables were summarized using frequency distribution tables. The Statistical Package for the Social Sciences (SPSS) version 21.0 (SPSS Inc., Chicago, Illinois) was used to analyse the data. Ethical approval for this study was obtained from the Human and Social Science Ethics Committee at the University of KwaZulu-Natal, South Africa (Reference number HSS/005/ 013M). The researcher was also granted 'gate-keeper' permission by the DUT Research Office to conduct the research. Three quarters (77, 76%) of the 101 students who participated in this study were female. Their median age was 20.0 years (interquartile range 19.0-21.0 years) and 96 (96%) were registered for the first time at DUT. Psychological readiness reflects an individual's state of mind in terms of being ready for e-Learning. A student's mental preparedness is one of the most important factors that could affect the success of e-Learning. In this study, the students' perception of readiness was measured before and after the e-Learning readiness classroom activity. 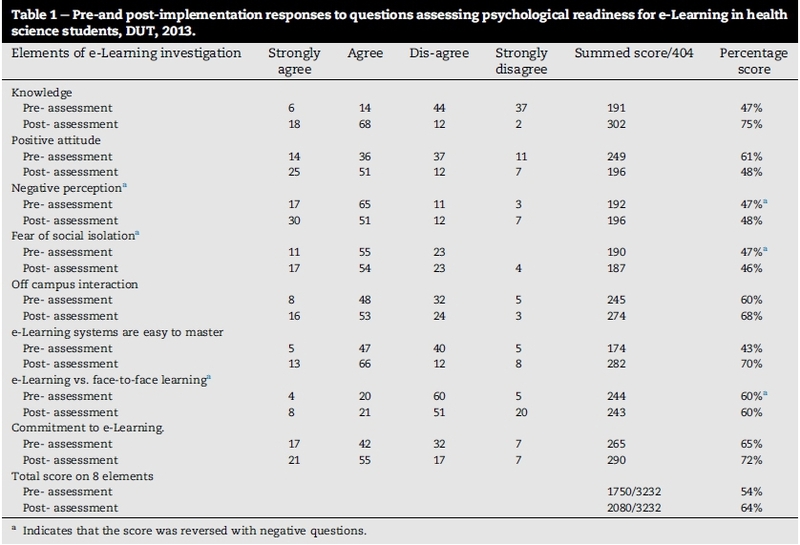 The summed score for all eight elements used to assess psychological readiness improved from 54% to 64% after the participants were exposed to the intervention (Table 1). Less than half (47%) initially knew what e-Learning was and this improved to 75% post-intervention. A positive attitude to e-Learning in two differently phrased questions was consistent and averaged 56%. Just less than half (46%) of the participants thought that e-Learning could lead to social isolation, but most DUT nursing students live in residence and enjoy an active social life. Pre-intervention, only 40% of the participants felt that online learning would be of the same quality as face-to-face learning and 57% were of the opinion that it would be difficult to master; this decreased to 30% post-intervention. Despite this, two-thirds (65%) of the participants had committed themselves to e-Learning. After the intervention the number of participants that did not positively embrace e-Learning decreased from 61% to 48% (Table 1). The assessment of technological readiness measures whether participants have appropriate technical skills to pursue e-Learning. No change was observed in the overall score on all ten elements used to assess technological readiness (from 69% in the pre-assessment to 68% in the post-assessment phase). In the pre-assessment stage, only 57% of the participants said that they had been trained to use a computer, which reveals a lack of the technological mastery required for e-Learning to be used effectively in this context. Only 46% came from schools that had computers. Most of the participants (89%) owned a cell phone and of these 88% were able to send a text message (SMS). However, whilst 73% stated that they knew how to use a computer, only 42% could send an e-mail, and of these only 47% could send an e-mail attachment. The majority (73%) had internet access, but only 68% felt comfortable with communicating with others electronically. Despite these technical limitations, post-intervention the participants' perceived technological readiness score increased to 73%, suggesting that, even though they had not been trained, they felt they could adapt to e-Learning in this context. Equipment readiness refers to the ownership of the equipment required to engage in e-Learning such as laptops, tablets, and personal computers. Before the intervention, only 59% of the participants felt that they had the necessary and suitable equipment to allow them to pursue e-Learning effectively. This dropped to 39% after the intervention due to their realisation of the equipment required for effective e-Learning. Using the Chapnick Readiness Score Guide, 74 (74%) of the students were categorised as "could be worse" (Table 2) in psychological readiness factors pre-intervention. The interpretation by Chapnick would be: "despite the fact that the participants are not mentally familiar with this form of teaching and, therefore, not ready for e-Learning, they fall into a category that allows for re-evaluation of the programme, to ascertain who resistors are and those who are classifiable as supporters". Post-test, the proportion that achieved a score categorised as having "psychological readiness" increased from 12% to 32%. The proportion of students with scores of being technology ready decreased after the intervention from 35% to 27% (Table 2). Most (58, 58%) were in the "dig deeper" category for technological readiness. This category allows for further evaluation of what is required in order to improve their technical skills, and come up with contingency plans to prepare the participants for the e-Learning transition. The post-intervention technological score revealed that the proportion in the "dig deeper" category increased from 58% to 65% as the reality of their lack of technological readiness became more apparent. For equipment readiness, most (68%) participants scored in the "equipment not ready" category, which illustrates that they do not have ready access to the correct equipment to allow for a smooth transition to e-Learning. This perception did not change post-intervention. This suggests that the participants are not able to obtain the equipment required to enable them to access an e-Learning classroom off campus. Turning to the overall e-Learning readiness score, most (72%) of the participants were categorised as "proceed with caution'. This means that, although these nursing students are not yet ready for e-Learning, they fall into a category in which e-Learning projects could work with support. The proportion in this category did not change after the intervention. The learning methods used to educate students at tertiary level are very dynamic. McVeigh (2009) observes that, while learning was once confined to the classroom, it now extends beyond the institution. She maintains that the future of nursing education will include e-Learning in order to facilitate lifelong, continuous learning. e-Learning can enable student nurses to achieve an effective balance between education, work and their personal lives. Studying at a self-directed pace outside the classroom is a strong motivation for implementing an e-Learning environment (ibid). e-Learning allows for flexibility in terms of time and is a valuable tool for student nurses. Chapnick (2000) describes psychological readiness as a person's state of mind regarding e-Learning. In this study, most of the participants fell into Chapnick's "could be worse" category for psychological readiness, but showed markedly improved scores after the intervention. Although the participants are not mentally familiar with this form of teaching and therefore do not fall in the "ready category" for e-Learning, they fall into a category that allows for re-evaluation of the programme in order to determine who the resistors are and those that can be classified as supporters. Although the participants are moving towards becoming psychologically ready, there is still a need for further evaluation. Pingle's (2011) study in India found that the right attitude is extremely important for the successful implementation of an e-Learning programme. She defines attitude as the way in which a learner perceives, believes, reasons and imagines the e-Learning programme. Although Broadbent (2002) concurs that students' psychological readiness is important for the successful implementation of e-Learning within an institution, the author notes the need for the right people at the right place with the right resources. It is essential that appropriately prepared and trained staff is available to support students (Worknowledge, 2003). Staff and student psychological readiness is in line with Chapnick's psychological readiness in terms of having the right frame of mind to implement e-Learning. Oketch, Njihia, and Wausi (2014) states that in order for e-Learning users to be able to use the e-Learning systems they should possess the necessary technical skills. Chapnick (2000) describes technological readiness as a situation where an individual has a degree of technical competencies that can be observed and measured. The first year nursing students that participated in this study do not fall into the "technologically ready" category. More in-depth investigation is required to identify those who do not possess the necessary technological skills to benefit from e-Learning and to come up with a course of action to address this need. If the participants lack skills, it should be determined whether they are given sufficient time to react positively, or if the programme should be adjusted. A study conducted in Vienna investigated the problems that may be encountered during the activation of a university-wide Learning Management System, owing to students' limited computer literacy or negative attitudes to e-Learning (Link & Marz, 2006). The authors concluded that in order to avoid students becoming frustrated with e-Learning, they must have a suitable level of computer knowledge. The current study highlighted the lack of the technological readiness which could lead to student frustration. Link and Marz (2006) conclude that students need to have adequate technological computer knowledge in order to avoid the frustrations experienced when trying to access an online classroom. The post-technological score revealed an increase in the "dig deeper" category. The frequency rose from 58% to 65%. This suggests that the intervention raised students' awareness of their limited technical abilities. If these technological weaknesses can be remedied the readiness factor would move to the "technologically ready" category (Chapnick, 2000). In a study conducted by Mitra (2005) it highlighted that younger children seem to be able to learn how to use computers on their own. This was demonstrated in "hole in the wall projects" where computers were installed in public spaces that were accessible to children. Mitra (2005) found that groups of children were able to teach themselves how to use computers if they were provided with the necessary technology. Hence it is important to highlight that if students are given the necessary technology they can become computer literate. These computer facilities should be located in a secure and safe environment (ibid). "Hole in the wall projects" are important as they show that individuals can become computer literate in areas where orthodox training is not available. While the place that a person becomes computer literate is irrelevant, Hussein Ali's (2010) study amongst tourism and hotel students in Egypt found that students must have a certain degree of computer and technological skills to be able to survive in an e-Learning environment and that it is imperative for a student to possess basic computer skills in order to achieve success in an online environment. The results of the current study reflect the findings of Karmakar and Wahid's (2000) assessment of technological readiness in Bangladesh. e-Learning is based on technology which involves students having access to computers and the Internet. The study found that the education sector in Bangladesh would benefit from e-Learning but it would need to provide improved technological support for learners. Borotis, Zaharias, and Poulymenakou (2008) highlight the importance of technology and content. They claim that technology that is compatible with e-Learning standards is important, as this will allow interoperability (ibid). They describe the technology acceptance model where a learner's satisfaction is assessed based on the acceptance and usage of e-Learning tools. Borotis and Poulymenakou (2004) also developed a model that examined technological readiness as one of their e-Learning readiness factors. Based on this model, Psycharis (2005) concurred that it is vital for an institution to explore technological readiness before implementing e-Learning. The Psycharis model of technological readiness included having access to the Internet as well as the availability of human resources capable of assessing the skills and knowledge of students involved in e-Learning and able to address the identified needs. Technophobia is one of the factors that limit an institution's ability to implement e-Learning (Aydin & Tasci, 2005). Rossiter and Watters (2000) conclude that there is a need for higher education institutions to address the issue of technological readiness by formally including it in their planning and delivery of academic programmes. This will enable students to develop the necessary skill sets required for self-sufficiency in an e-Learning environment rather than resisting new methods. Link and Marz (2006) propose that, in order to prevent students from developing "computer-hostile attitudes" pre-ventative measure should be set in place that would offer them the opportunity to gain basic knowledge of using a computer. Such measures could include computer courses that would enable students to obtain the basic skills required to survive in an e-Learning environment. Chapnick (2000) describes equipment readiness as a situation where an individual has the necessary equipment to implement e-Learning. The current study found that the participants do not possess the right equipment for a smooth transition to e-Learning. It is clear that DUT needs to analyse the importance of e-Learning and how it will benefit the programme or institution. All stakeholders should be involved in such an assessment. Since proper equipment is necessary for the implementation of e-Learning for first year nursing students at DUT, alternatives such as marketing the e-Learning initiative in order to attract investment from companies should be explored; this would enable students or the institution to rent rather than own such equipment. In the past decade, nursing education has been transformed by the use of ICT as the dominant form of education and training delivery (Ajayi & Ajayi, 2006). A study conducted amongst second year nursing students at an Egyptian university confirmed that e-Learning is an effective teaching method in nursing education (Abdelaziz, Samer Kamel, Karam, & Abdelrahman, 2011). A control group of students was exposed to traditional lectures and the study group used e-Learning. It was noted that students in the study group found e-Learning effective; it broadened their knowledge and understanding of the subject. However, while this proved to be an exciting way of learning, the challenge was that not every student had the necessary computer skills to enable them to benefit from e-Learning. It was recommended that, students should be equipped to embrace diverse ways of learning rather than relying on traditional face-to-face learning (ibid). Aydin and Tasci (2005) note that, in order for an institution to implement e-Learning, it should have the proper hardware (access to computers) necessary to facilitate this process. Oliver and Towers (2000) concur and observe that, without proper equipment, it is difficult if not impossible to adopt and implement e-Learning within an institution. The majority (72%) of the study participants fell within Chapnick's overall readiness "proceed with caution" category for both the pre-and post-assessments (Chapnick, 2000). Chapnick (2000) noted that most organizations and institutions fall into this category. Based on her model, Chapnick (2000) advocates that it is important for an institution to further evaluate the factors that prevent an institution from implementing e-Learning. The factors being psychological readiness; sociological readiness; environmental readiness; human resource readiness; financial readiness; technological skill readiness; equipment readiness and content readiness. Oketch et al. (2014) states that there are common factors such as technical readiness, content readiness, human resource readiness and financial readiness that needs to be considered before the implementation of e-Learning. Okinda (2014) concurs that learners must have the basic technical readiness skill so that they may concentrate on learning. He also states that learners must have the correct technology that should be reliable and compatible. This highlights the equipment readiness factor which advocates that for e-learning to be implemented these factors should be taken into consideration. The implementation of e-Learning is a necessity for any higher education institution that seeks recognition as a 21st century university. e-Learning sets the pace for how students learn. Maximizing e-Learning is very important as it will attract many different types of students and determine their success. Therefore it is important to evaluate e-Learning readiness before the adoption and implementation of e-Learningtobesuccessful.ThisstudywasconductedatDUT among first year nursing students registered for anatomy and physiology. It was a small scale study and the selection bias of only including nursing students may have contributed to students' perceptions of e-Learning as the learning areas used were previously taught in a traditional manner in the classroom. This study found that the participants are not technologically ready to fulfil e-Learning requirements. Based on these findings, it is recommended that students be supported to develop computer skills. The study found that, while e-Learning is valued by undergraduate nursing students, they lack equipment. It is thus recommended that equipment be made available for e-Learning in order to ensure the success of this mode of learning. It is important to acknowledge that students require the proper resources to make optimum use of materials; therefore it is imperative that the institution supports students by providing them with the hardware required to facilitate the e-Learning initiative. Although a readiness evaluation is important, this research only highlighted three aspects of the Chapnick model (viz psychological, equipment and technological readiness). The data collected for this study were analysed using the Chapnick model (2000) that explores eight readiness factors. Due to time constraints, only three factors were assessed. In terms of future research, it is recommended that the other five readiness factors (sociological, environmental, human resource, financial and content) be explored in order to determine how ready an institution is to implement e-Learning. E-mail addresses: marilynnc@dut.ac.za (M. Coopasami), knights@ukzn.ac.za (S. Knight), mpete@dut.ac.za (M. Pete).